Now is the perfect time of year to get organized because the never-ending festivities of summer have come to close, the kids are back in school (well, for me that actually adds to my busy schedule! ), and it will be a great feeling to have your house organized before the holidays are even close to hitting! I'm getting organized around our home little by little. It is definitely a process and not something that will occur over night. I've actually been working on this for months now by slowing working my way through closets, bedrooms, clothes, toys, drawers and the like by getting rid of things we don't need. One of the best ways to start getting organized is to get rid of anything and everything you are not using nor plan to ever use. The kids and I have gone through just about every single toy they own and if they aren't playing with it anymore or have gotten too old for it, we moved it to the garage sale pile. (I do not go through their toys and get rid of things without their permission. I want them to know they can trust me with their things. Besides, it teaches them how to think through whether or not they truly need something still. Sometimes I just we give an item away if I think it's something another child we know will use. Otherwise it goes in the "garage sale pile." If they sell a toy at the garage sale that they received as a gift, they get to keep the money. We are encouraging them to save some of that money in their on-line savings account that we started as a result of My Job Chart and the rest they can use to put towards something else they'd rather have. It really has been a great feeling to purge our home of things that were taking up space literally and mentally. Although my home is far from being as organized as I would like, I am much closer to that goal after getting rid of things we aren't using. Another facet to organization is utilizing storage units and such. I'd like to show you my favorite shoe rack ever. In fact, now that I have one, I want another one to use in my closet. I reviewed this shoe rack from Space Savers and after browsing their online catalog I can tell you this isn't the only great item from this company that I would love to have in my home. They carry space saving units for your bathroom, laundry room, closets, and more. 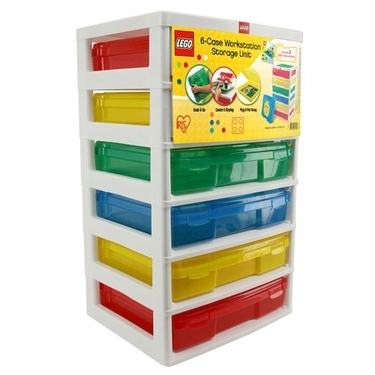 And our kids really like these LEGO storage solutions. We'll be adding them to their Christmas lists, for sure! 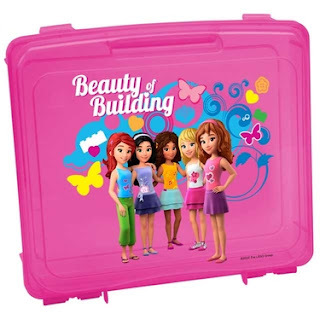 Carlee's pick for her "girl LEGOS"
This would work great in our oldest son's room for all his LEGOS! 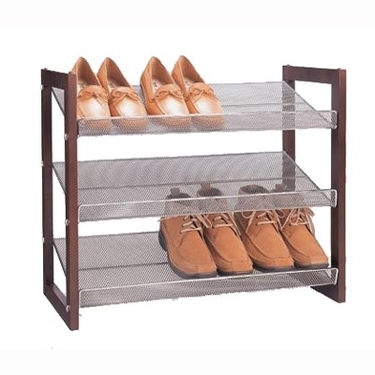 The stackable shoe rack I reviewed is 3 tiered and is made from wood and chromed metal. It holds 9 pairs of shoes (or more if you have little feet in your home) and is 25 in x 11.5 in x 21 in. which is just right for limited spaces. I have ours right at our entry way and I cannot tell you how much I love having our shoes organized like this. Prior to this I had a mat down, but inevitably the shoes would work themselves off the mat and be scattered across our very small landing. 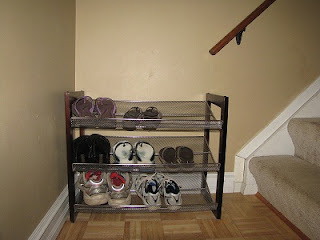 After putting our shoe rack at the entryway it was quite easy to train the family to put their shoes on the rack as soon as they entered our home. Our home is a bi-level so as you can see, our stairs are right at the landing and we go up and down this area numerous times a day to get to the upper or bottom level. It's safer having the shoes placed on the rack rather than scattered at the bottom of the stairs because one of these days someone was going to trip on them. Take a minute or two to check out Space Savers. I'm sure you'll find something you'll like! Although the following sponsors are not sponsors of this product, I am blessed to have them on Purposeful Homemaking. Please take a minute to check out their links. Disclaimer: I received this product at no cost to me in exchange for an honest review.